The Q&A panel: Sharon Peterson, Rod Hughes, Pamela Kalkandis, Kristen Bindley and Wendy Pavlek. Blacktown Hospital hosted Western Sydney Local Health District’s Allied Health research forum on 10 August. Allied Health Professor Vicki Flood kicked off the session with an overview of the Allied Health Research Strategic Plan and the potential for funding and support. Kristin Bindley, a bereavement counsellor based at Mount Druitt Hospital, presented a qualitative study undertaken at Mount Druitt Hospital’s supportive and palliative care unit on experiences of bereaved carers. Kirstin’s presentation was engaging and showed the value of qualitative research and the power of client voices in clinical care. Sharon Peterson, a research officer at Nepean Blue Mountains Local Health District, showcased her sexual assault photography research currently in progress across Western Sydney and Nepean Blue Mountains Local Health Districts. The presentation provoked much discussion about consent. 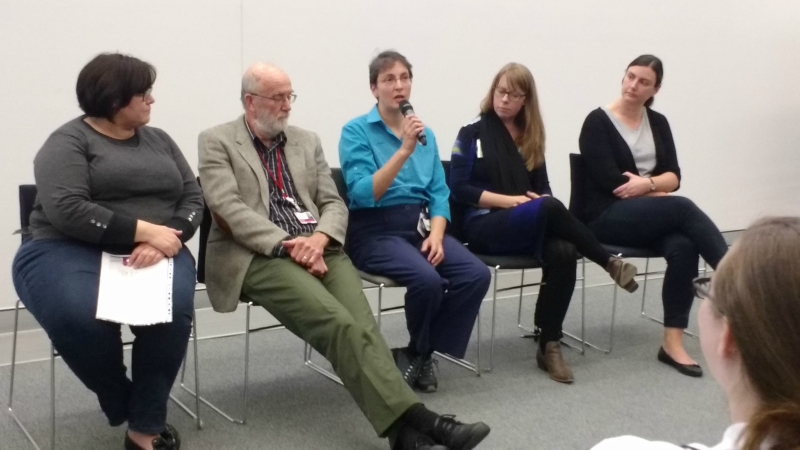 Both presentations and the Q&A panel gave Allied Health clinicians the opportunity to see how research is possible within the clinical environment and how much of what clinicians already partake in can be transformed into research.